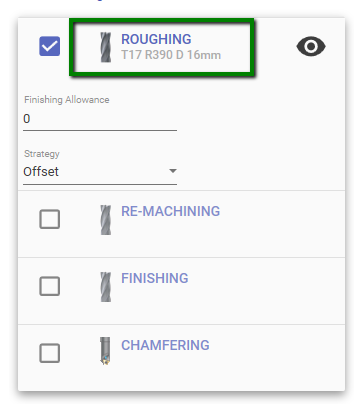 To select different tool or simply change machining parameter you need to open tool selection dialog. In machining screen , click on operation type description. Click on tool name , on top of the 3D Viewport. From operation treeview, click on tool icon. After clicking on one of the button above, the tool dialog will appear. Here you can edit current tool, select another from list or just edit the cutting data parameter. The tool list it&apos;s filtered so it show only compatible tools with current operation. From this dialog you can choose a different tool, or change tool machining parameter. 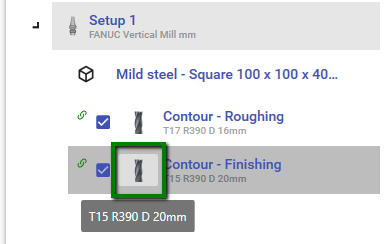 To change tool, press SELECT TOOL or the RIGHT ARROW button at the side of tool description. To see all the tool available in tool database, please take a look at this post.